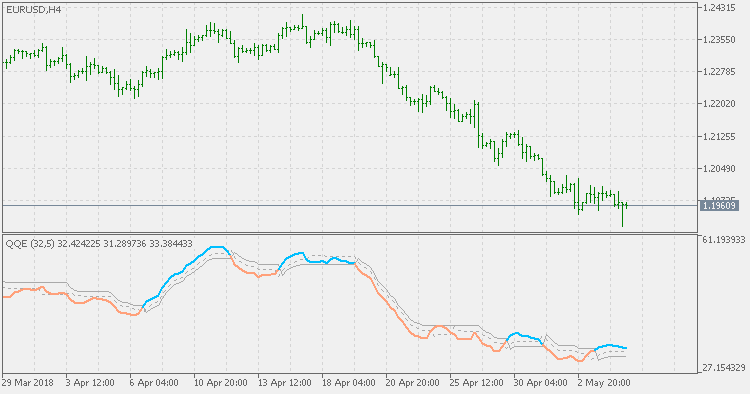 The Fast Trailing Level (TL) and Slow TL are constructed by calculating the average range of the smoothed RSI over n-periods and then further smoothing the average range using an additional n-periods Wilders smoothing function. This smoothed average range of RSI is then multiplied by the Fast and Slow average range Multipliers to calculate the final Fast and Slow Trailing Levels. Could you point me some source into detailed explanation about QQE calculation? Maybe the original one? I know your code tell everything, I am rewriting to build a personal code base for MQL4 and MQL5. I just want a better understanding about the calculation and differ what modification you add into calculation in every new indicator that you made. The QQE indicator consists of a smoothed Relative Strength Index (RSI) indicator and two volatility-based trailing levels (fast and slow). The Fast Trailing Level (TL) and Slow TL are constructed by calculating the ATR of the smoothed RSI over n-periods and then further smoothing the ATR using an additional n-periods Wilders smoothing function. This smoothed ATR of RSI is then multiplied by the Fast and Slow ATR Multipliers to calculate the final Fast and Slow Trailing Levels. RSI / Fast ATR TL or Slow ATR TL Crossover: A buy signal occurs when the RSI crosses above the Fast ATR TL or Slow ATR TL and a sell signal occurs when RSI crosses below the Fast ATR TL or Slow ATR TL. RSI / 50-level Crossover: When the RSI crosses above 50 a buy signal is given. Alternatively, when the RSI crosses below 50 a sell signal is given. Fast ATR TL / Slow ATR TL Crossover: A buy signal occurs when the Fast ATR TL crosses above the Slow ATR TL and a sell signal occurs when Fast ATR TL crosses below the Slow ATR TL. Divergence: Looking for divergences between the QQE indicator and price can prove to be very effective in identifying potential reversal points in price movement. Trade long on Classic Bullish Divergence: Lower lows in price and higher lows in the QQE; Trade short on Classic Bearish Divergence: Higher highs in price and lower highs in the QQE. Overbought/Oversold Conditions: Much like the original RSI (and other oscillators), the QQE indicator can be used to identify potential overbought and oversold conditions in price movements. An Overbought condition is generally described as the QQE being greater than or equal to the 70% level while an oversold condition is generally described as the QQE being less than or equal to the 30% level. 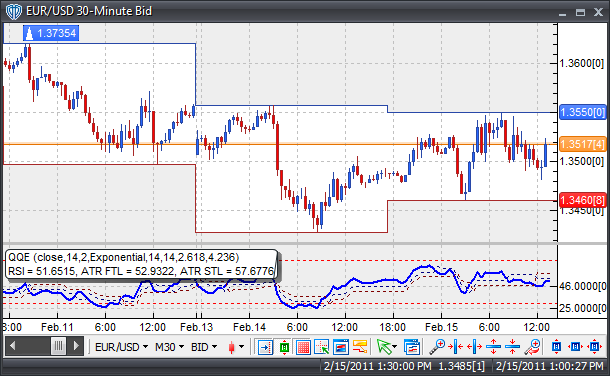 Trades can be generated when any of the QQE outputs (RSI, Fast ATR TL or Slow ATR TL) crosses these levels. When the RSI, Fast ATR TL or Slow ATR TL crosses above 30 a buy signal is given. Alternatively, when the RSI, Fast ATR TL or Slow ATR TL crosses below 70 a sell signal is given.